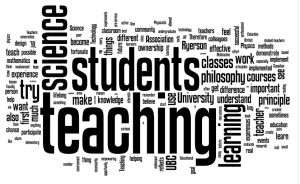 It is a difficult if not impossible task to accurately describe one’s teaching philosophy without having an opportunity to demonstrate how this teaching philosophy is implemented in a real classroom. I strongly believe that teaching reflects who we are and what we believe in. Therefore, the best way to illustrate my teaching philosophy would have been to invite you to visit my classes at the University of British Columbia (UBC) and let you observe first hand our learning environment. The first principle is that being a Science Educator to me means much more than just being a person who conveys a bunch of science principles to the students. My goal is to make a difference in students’ lives via helping them to be successful in science study, to start seeing things in a different light and what is the most important of all, to start believing in themselves. Since I work with future teachers, it is very important for me that they have positive and empowering experiences in my courses. I believe that genuine science learning is a very empowering and exciting experience and every student (a science or a non-science major, a pre-service or an in-service teacher) has the right to experience it. It is very important for me to teach my classes, so the students want to attend them because they feel that they get something special out of this experience, which they cannot get out of just reading the text book or downloading the notes from the internet. I also want to show that science is a very human endeavour and it is being created by men and women like them, whose often small and sometimes big contributions made a big difference. That is the reason for my using interesting lecture demonstrations intertwined with the real stories illustrating the work of scientists, their struggles and discoveries. I also try helping my students see that scientific knowledge should not be judged by the status (authority) of its creator, but by the experimental evidence. Therefore, I try to use micro-computer-based experiments, Vide-based analysis and other modern technological tools during the lectures to demonstrate firsthand how science knowledge is created and validated. The second principle reflects my belief that whatever teaching method is implemented in the classroom the students have to have ownership of their learning. Learning cannot be imposed on anybody, therefore ownership is the key to success. One can impose memorization or cramming, but real learning is an active process and the students have to be in charge of it – to have ownership of their learning experiences. To implement this teaching principle in various courses I have taught over my science teaching career (such as classes of 250 first year undergraduate students (at UBC), 150 first year engineering students per at Ryerson, 25 students in my upper level Modern Physics course at Ryerson, or 20 pre-service elementary teachers in my UBC courses), I do a number of things. First of all, I try to get to know my students and their interests, as much as I possible. I try to learn students’ names, their interests and aspirations. This is especially important for student-teachers (I teach both elementary and secondary student-teachers). This makes the students more willing to participate in the classes. I also make myself available via e-mail, extended office hours and just open-door policy, so the students get to know me and it helps break the barrier between us. Second, I try to make them involved in the lectures/lessons as much as possible: students help me design and demonstrate lecture experiments, they ask questions, participate in class discussions, take part in the small group clicker-based activities which I try to use in every class. I also hope that in my classes the students do not see me as a dispenser of knowledge, but as a person who tries to help them figure things out. I occasionally make mistakes during the lesson (sometimes on purpose and sometimes not) and I am very proud that the students check my work and feel free to correct me when needed. For example, while teaching science methods courses, I make sure the students design their own lesson and unit plans and have a chance to share them with everybody. However, I try to provide ample formative assessment, such as both the students and I learn as much as possible from these experiences. In addition, I try to use different educational technologies, such as future teachers have a chance to experience them and see their potential. In order for them to have ownership of their learning, the students have to have a chance to experiment, try new things and see what works for them. The third principle is that lifelong professional development is the core of our profession. Effective teaching requires continuous reflection and rethinking. If we want our students to become lifelong learners, we have to become lifelong learners ourselves. The teacher who does not constantly think about teaching, does not try to understand deeper the content he or she teaches, or does not try to find more effective teaching methods cannot, in my view, be an effective teacher. That is the reason for my active involvement in the OAPT (Ontario section of the American Association of Physics Teachers), Canadian Association of Physicists, and National Science Teachers Association. Thinking about teaching through ongoing research and involvement in professional organizations is a key-issue for a successful teaching. My area of research is science/physics education and the area of my particular interest is effective use of technology in inquiry-based science teaching. I was very fortunate to receive a number of local, national and international grants to investigate our teaching and design innovative science courses. In 2008 while at Ryerson University I was a PI on a successful HP Educational Technology Grant that allowed us to implement HP Mobile Technology Classroom with tablet PCs. In 2010, I received a UBC Educational Technology grant that allowed me to implement peer response system in science methods courses. The fourth principle of effective teaching is based on the idea I first encountered a few years ago while reading a book by Wilbert McKeachie “Teaching Tips” (McKeachie, 1994). He emphasized there that only after the teacher understands the difference between learning and teaching he or she can become a teacher. Learning and teaching are two different things, which are often erroneously referred as having a causal relationship. Teaching does not necessarily cause learning and learning does not necessarily require teaching. Therefore, our goal is to create a learning environment in which students will want to learn. We cannot force our students to learn but we can support and motivate them in their learning endeavour. One of my biggest goals and challenges is to motivate the students in science studies. This is especially important for me when I teach future architects, non-science majors and all the students who are unfortunately are science- and mathematics- fobic. The last but not the list principle of my teaching philosophy is that if we want to make a difference in how much effort faculty members invest in teaching and how teaching is valued and rewarded, we have to create a teaching community which will help us gradually transform the entire academic culture at our departments as well as at the university as a whole. While at Ryerson, I invested a lot of effort into helping foster this physics and science teaching community at the Faculty of Engineering, Architecture and Science. Now at the Department of Curriculum and Pedagogy at the Faculty of Education at UBC, I continue working on building science and mathematics education community. I feel very fortunate to work with many colleagues who share these ideas. 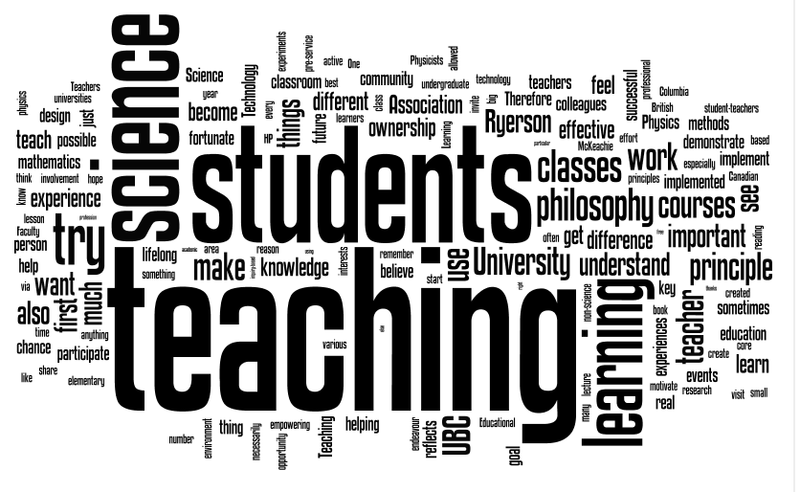 I actively participate and lead events related to science teaching and learning, such as MasteringPhysics Workshop, Special Round Table on clicker use in undergraduate teaching, events on technology use in the classroom and on teaching large classes, various science outreach events at UBC, Nationally and Internationally. I feel very fortunate and privileged to have an opportunity to have been teaching at the very best universities in the world such as the University of Texas at Austin, Rutgers University, Ryerson University and the University of British Columbia and to work with so many wonderful colleagues who care about science and mathematics teaching and physics/science education and are ready to offer their expertise, time and knowledge to our common goal of improving science teaching and learning at our schools, colleges and universities. I invite you to visit my classes to see how my teaching philosophy is implemented into practice. My teaching philosophy is a work in progress. As I grow as a teacher and as a learner, it also changes. I hope it reflects my personal growth. I was very happy to be awarded The 2010 Canadian Association of Physicists Medal for Excellence in Teaching Undergraduate Physics. Many thanks to my colleagues and students who nominated me.